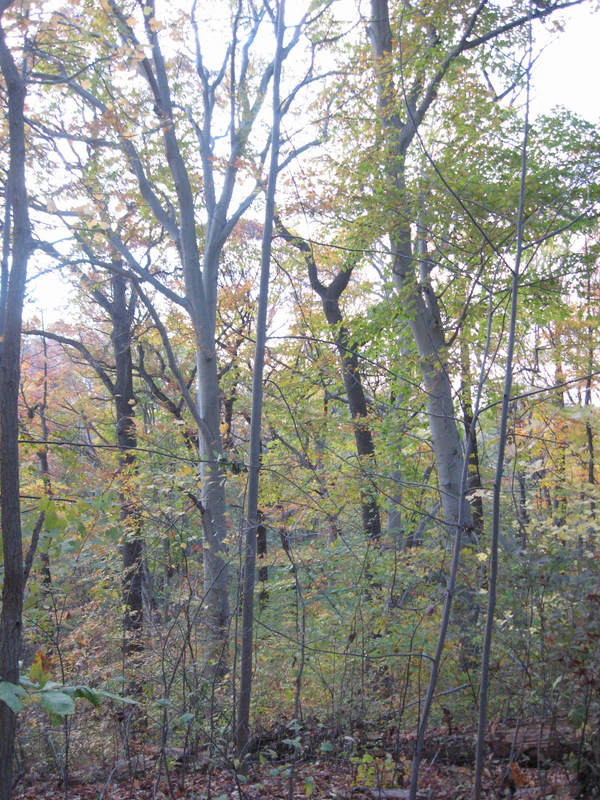 THE ONGOING PROJECT OF REMOVING THE BURNING BUSH (EUONYMUS ALATUS) FROM MORRIS PARK CONTINUES. 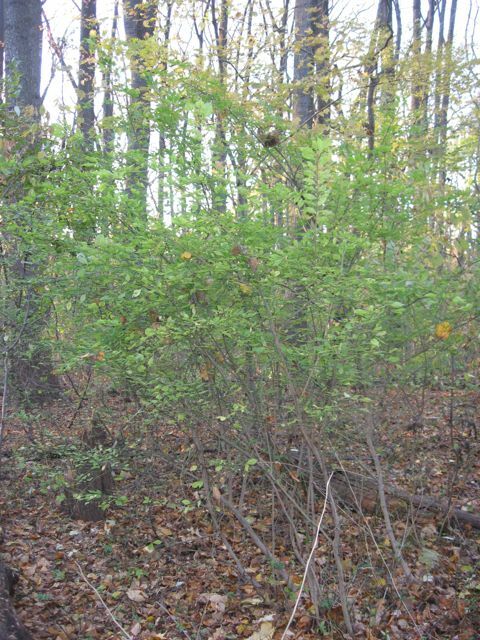 WE OFFER YOU A FEW TIPS ON ITS REMOVAL, AND A QUICK LESSON ON TELLING THE DIFFERENCE BETWEEN THE NATIVE HEARTS-A-BUSTIN’ (EUONYMOUS AMERICANA) AND THE INVASIVE BURNING BUSH. 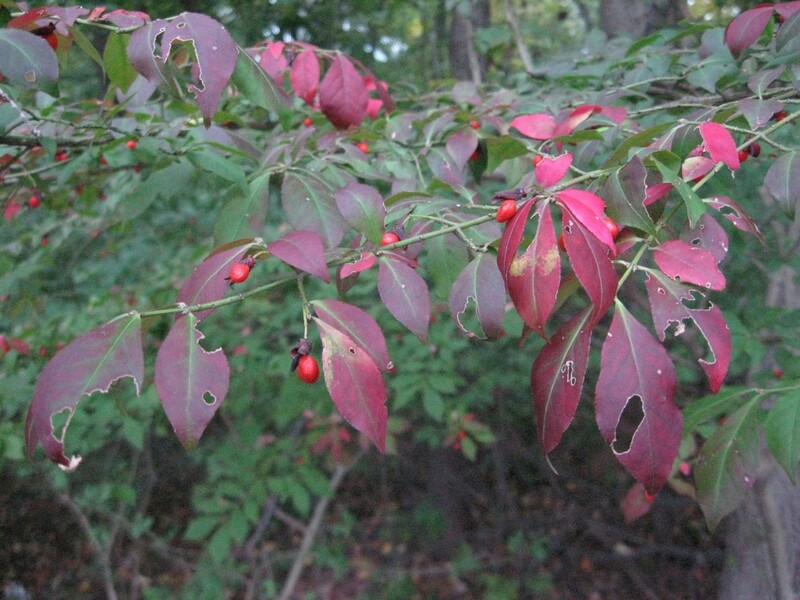 This bush gets its common name from the bright red foliage in the fall. It was a favorite for landscapers for too long, and can be found on foundation plantings next to commercial buildings and alongside roads and parking lots. 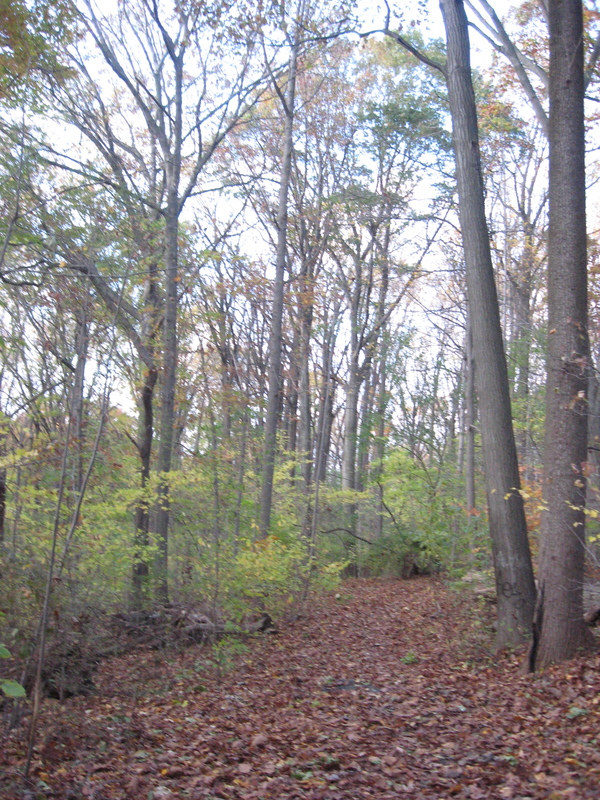 It has spread into the adjacent forests, and here it is in Morris Park. Here is a clump of this species growing in the park. 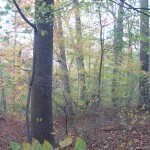 It is extremely shade tolerant, and when leafed out, will shade out the herbaceous layer of the forest, leaving a barren area below it. It seeds itself prolifically, creating a problematic situation, as the forest becomes less and less of itself and more and more about this messy alien shrub. Habitat for species -specific insects is lost, and with the diminished insects, the birds we love to have in our park are also diminished. So now, removal is the best thing that can be done. 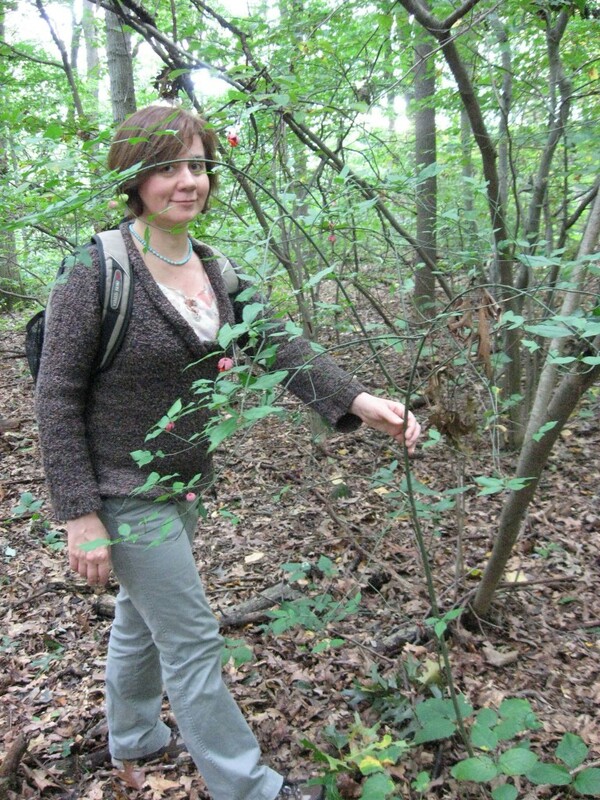 It is a great cardiovascular exercise, and a good excuse to be outside, doing something useful for your neighboring forest. We will help you identify them and remove them. The most tell-tale give-away is the corky winged branches of this simple-leaved shrub. The wings occur at 90 degree angles to each other and are a very prominent feature. 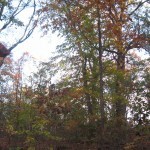 The red fall color and the bright red berries are also distinguishing. 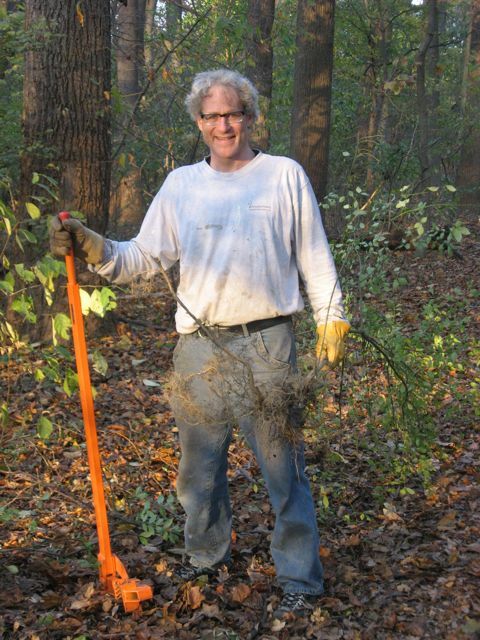 We mechanically remove the bush with a large steel weed wrench supplied to us by the friendly and knowledgable staff of the Philadelphia Parks and Rec department. We bought our own saws and clippers and cut out most of the bushes mass, leaving a three foot stump. That way it is easier to pull out the roots, without brushing up against the plant and having it get in our faces as we wrestle with it, exposing us to ticks. Wear your socks over your light colored pants and inspect yourself and wash your clothes and take a shower after this work day! 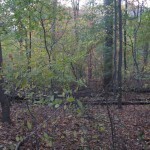 The conditions in a forest that would have a Burning bush infestation are also likely to have a deer and disease-carrying tick infestation. This great tool makes it easy to pull out the roots. This process is dirty, as the soil is spread all over as the root is unearthed. 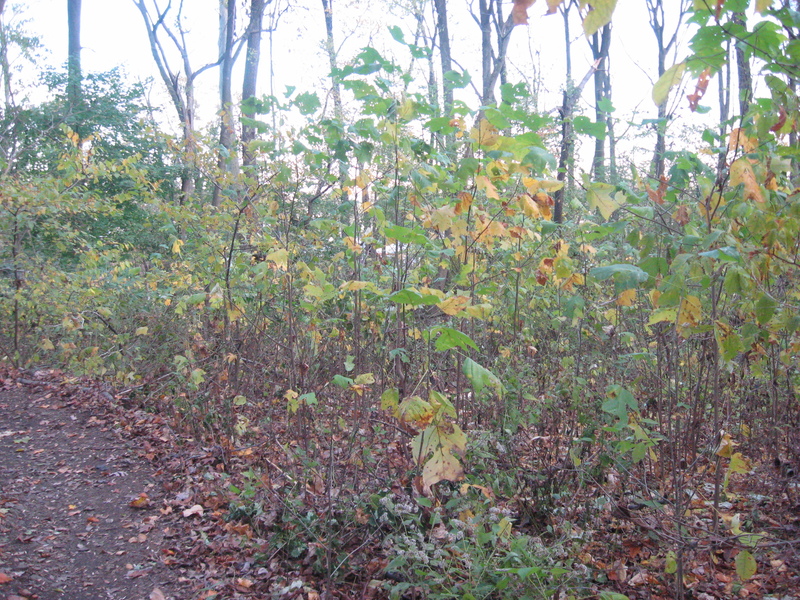 If we do not do this, and just cut the bush down, it will re-grow again, rapidly. 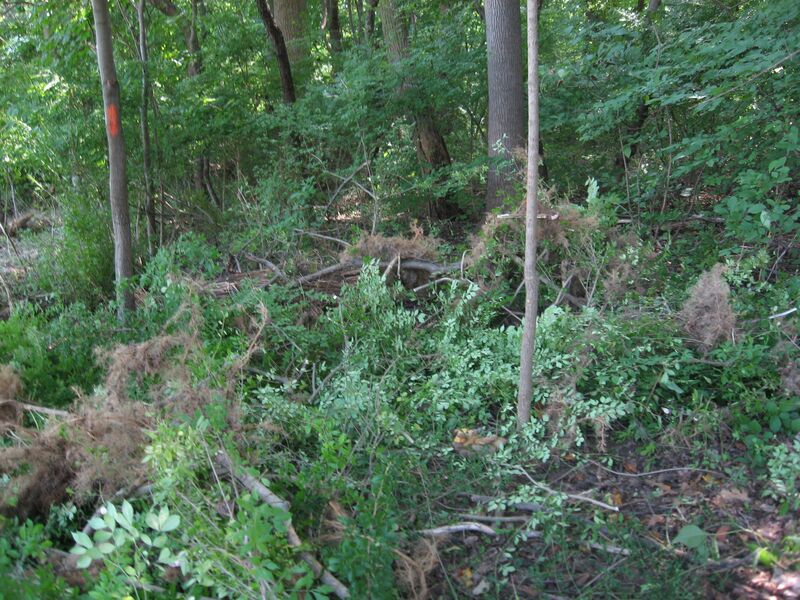 Removing the bush this way disturbs the soil and there may be an exposure of the roots of native herbaceous plants, insect eggs and insect habitats. This is problematic and some may prefer to just cut the bush down and return to every single bush year after year and keep cutting it down until it hopefully finally dies, with the soil left in place. This is the ideal methodology, but will require the extreme care and follow-through of the most thoughtful and attentive land steward. If you choose the pull-it-all-out method, be aware of the roots of native plants, and make an effort to put them all back with an inch or so of soil put back on top. Cover the area back up with leaves, so it looks as if there never was a bush there in the first place. 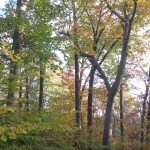 The idea is to make as few changes as possible to the forest ecosystem. The best job is the one that looks as if there was no work done in the first place. What to do with the Bush after it is removed? We leave the bush on the site, cut up and scattered about, the roots hung up on old branches, not touching the bare soil. 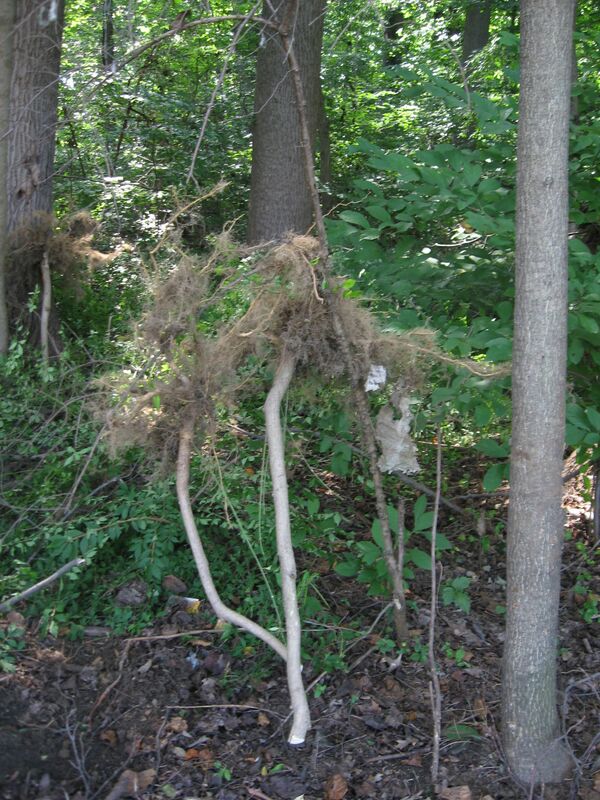 Very rarely will a pulled-out bush reattach itself to the soil and re-grow. It may look a bit ugly at a first glance, but within a few short years the site will look like a healthy forest again, and the Burning bush will have decomposed into the soil, providing bio-mass for the native plants that will return. Think of what the site will look like in five years! If you choose to not pull out the roots and still want to kill the bushes, consider herbicides. 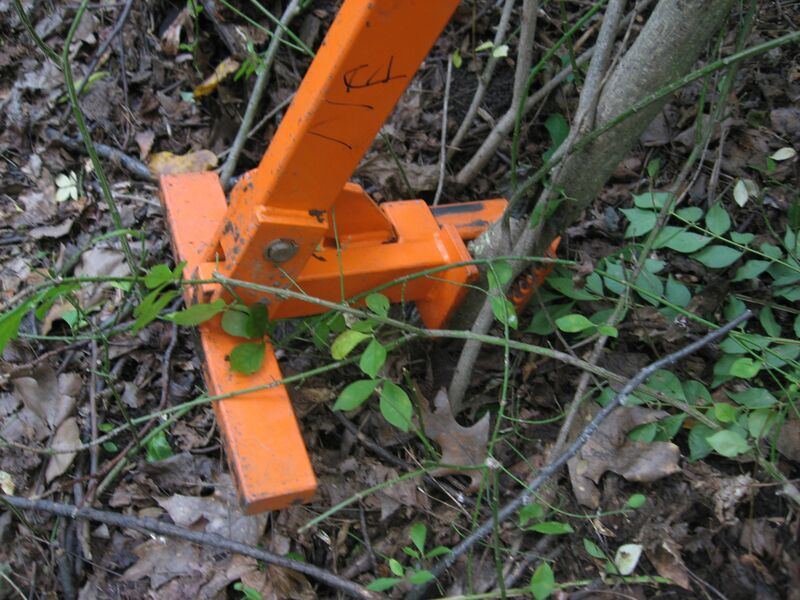 In our situation as volunteers, we are not permitted to use them, so are left with the pulling and cutting options. 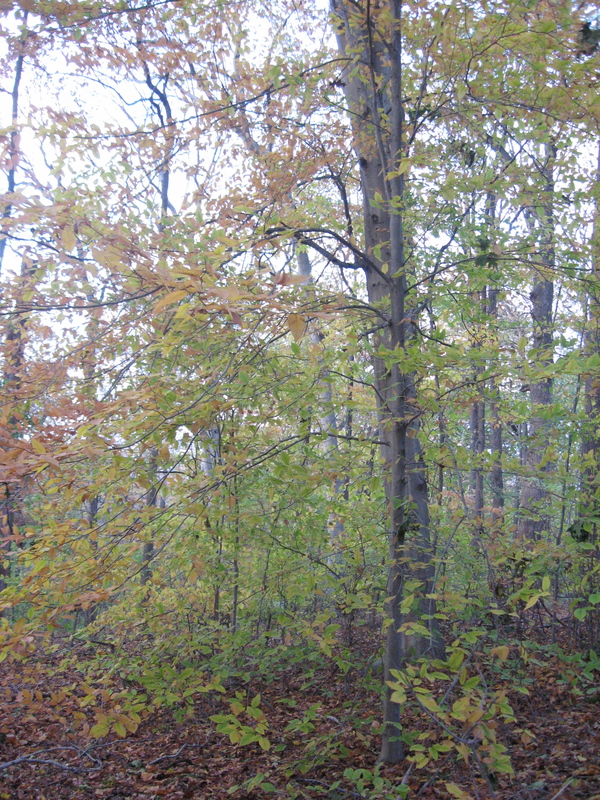 Consider a glysophate herbicide, with a cut-and-paint approach or basal bark application, in the late winter. Be sure to know if you are allowed to use herbicides if it is on public property. 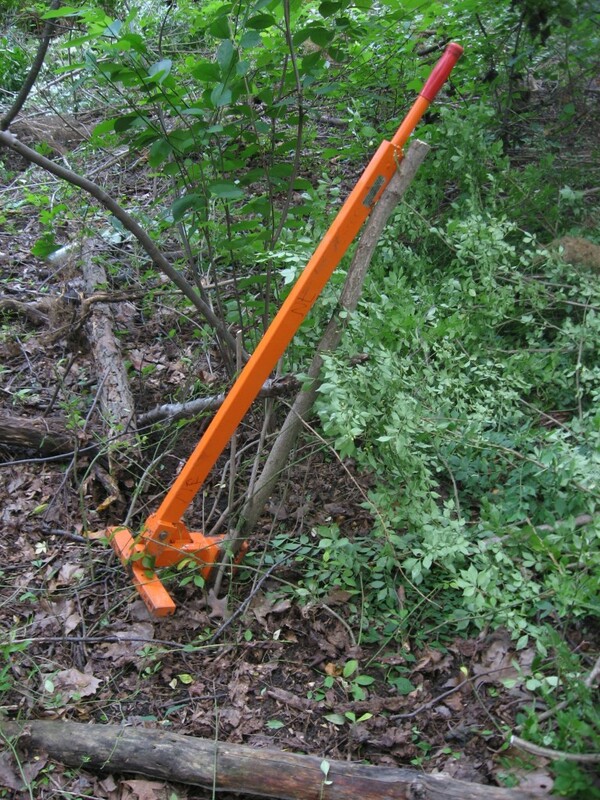 As far as the issue of soil disturbance from pulling out the roots manually goes, this may actually be beneficial in the case of severe infestations, because it has the potential to bring to the surface long dormant seeds of native plants that will have the opportunity to sprout after the bushes have been removed. 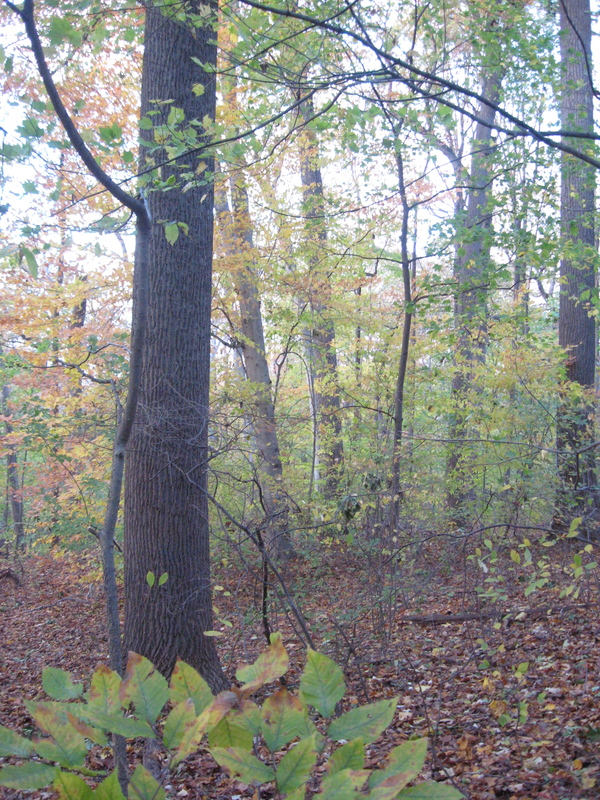 Even if your method is in need of refinement, just by addressing the problem at all is a great start to improving the forest you are adopting. 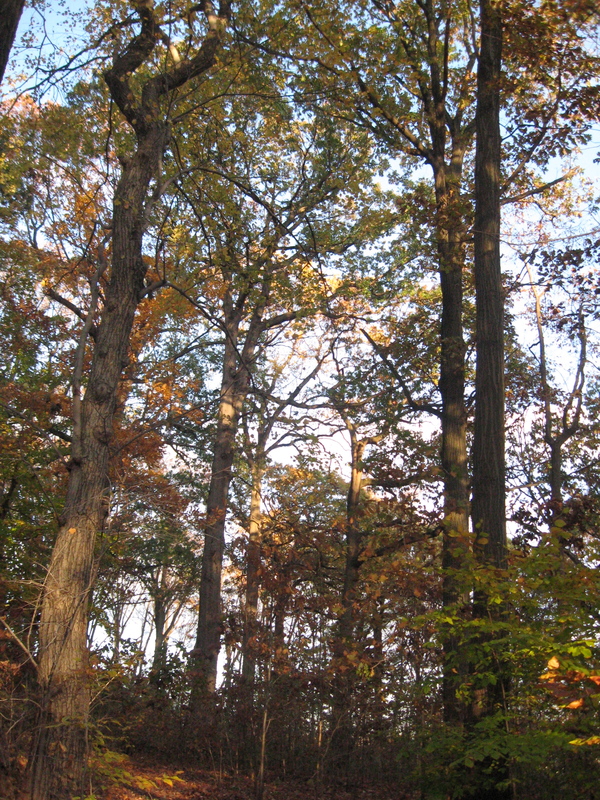 As you go, you can discuss the finer points of your environmental restoration efforts with your neighbors and all those interested and engaged with the forest. 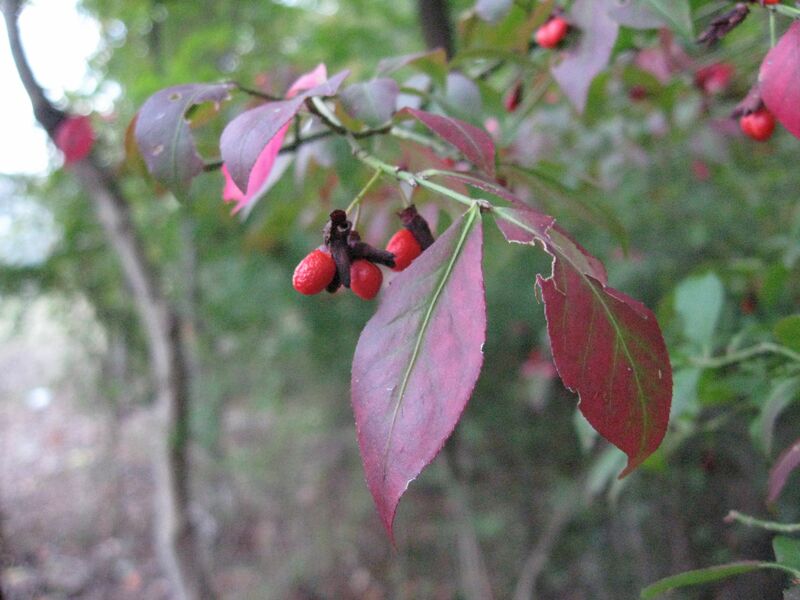 The invasive Burning Bush, (Euonymus alatus) above. 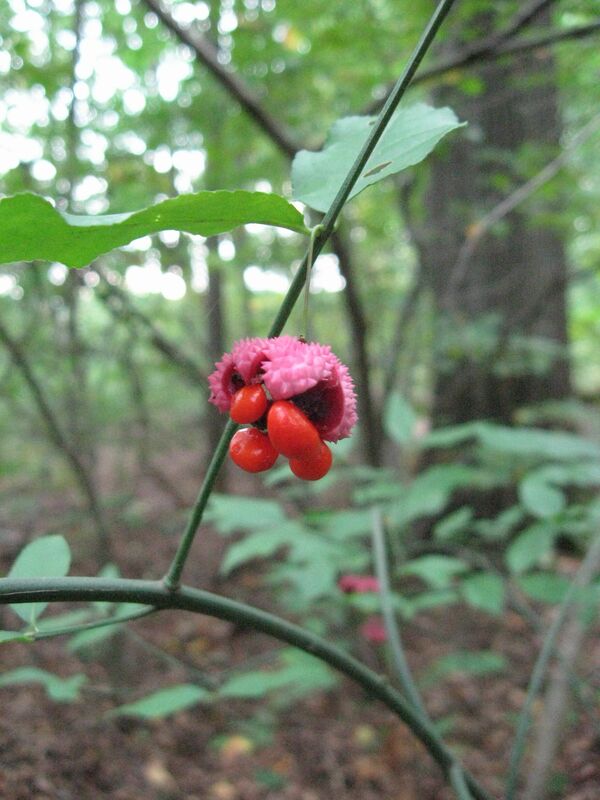 Also called the Winged Euonymus. The corky, almost papery wings are very noticeable. On some specimens, the wings are not so pronounced, but they are still in evidence. 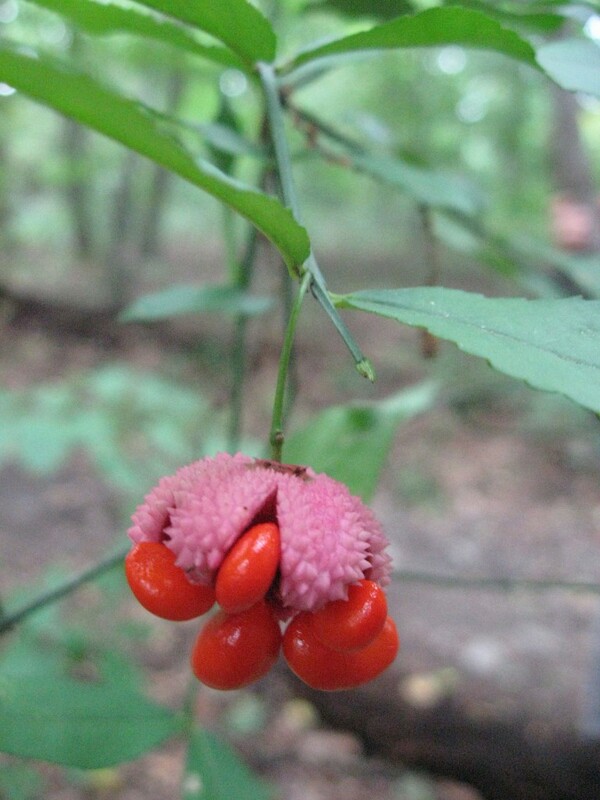 Pictured below is the native Euonymus americana, the Hearts-a-Bustin’ or Strawberry bush. While there are similarities of these two related species, the differences are distinctly noticable. 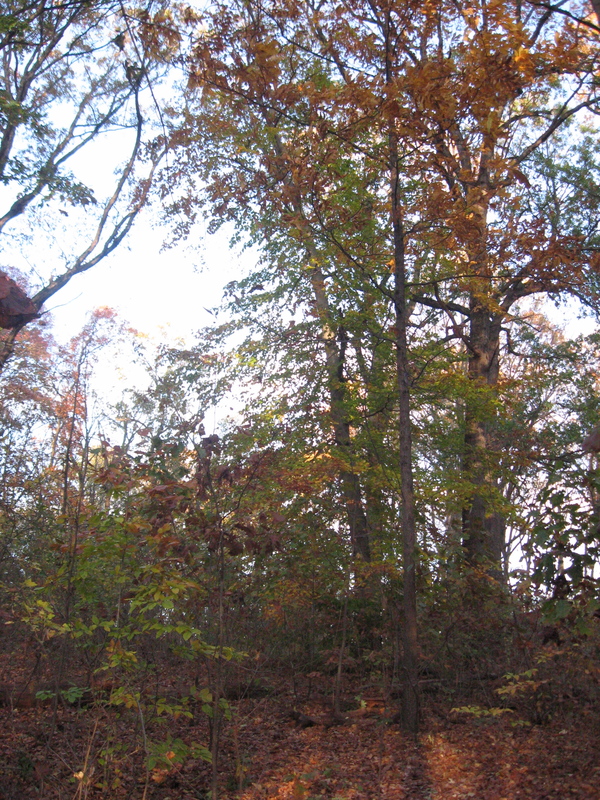 The native one has much smoother, green branches, lacking the winged habit of the invasive exotic. The seed production of the native one is unforgettable, the way the bright red fruit appears to burst out of the rough pink casing. 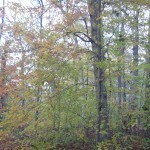 The habit of the native bush is open and airy, whereas the invasive one is denser. Above, the native, below the alien. Note the differences (pink fruit casing on the native) in the fruit, as well as the similarities. (the red berry). If you are unsure of the status of a specimen, do not attempt to eradicate it! 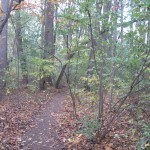 Native and non-native Euonymus can grow side-by-side. When you pull out the infestations of this bush from your adopted forest, you may be surprised to see what will grow in their place in the following years. 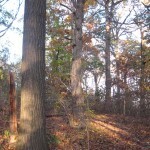 Be prepared for numerous seedlings of the invasive alatus to pop up, that you will need to weed out, but also be ready for native surprises to emerge from a soil that has not had a late spring sun grace it in many years! If you feel you really need to plant something as a replacement, then go ahead and purchase the native Hearts-a-bustin’ at the many native plant nurseries that offer it. 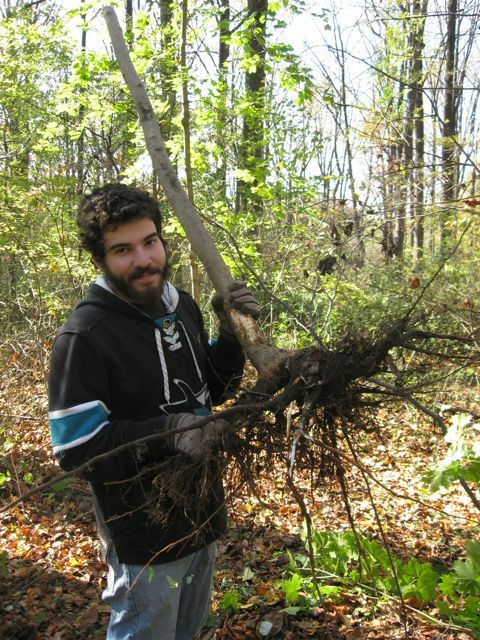 Please let us know how your invasive removal project is going! Your comments and insights are much appreciated! Walking the streets of Paris is a favorite pastime of ours, so much that we must plan for days of unplanned walks between engagements and gatherings. Once the time is established for wholehearted play in France’s City Of Trees, the walks become serendipitous wanderings that carry us through the Paris of centuries, where discoveries are made, and adventures are had, in which we cross through the boundaries of sight-seeing into the daily routines of Parisians. 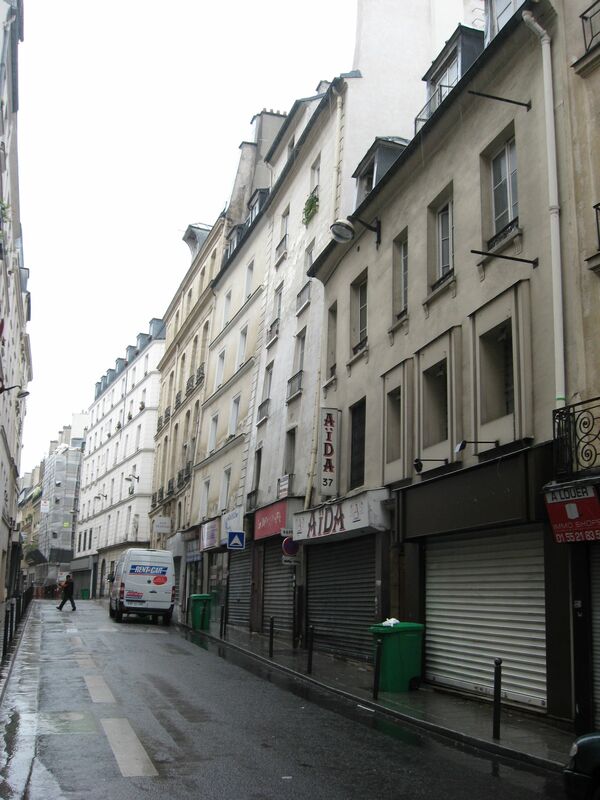 We know we have made that special entry into the streets of Paris when we have wandered off into a district accidentally and we find ourselves at once very much part of the routine, and at the same time experiencing it as fresh observers. We are waiting in line in a patisserie to get those fresh croissants and a baguette (for later) and then find ourselves looking for a delicious cheese in the neighborhood grocery, so we can keep walking, stopping all along the way in the many small parks that have been established all throughout the city. The first part of our venture is assembling a picnic, which we spend the afternoon eating as we go along. 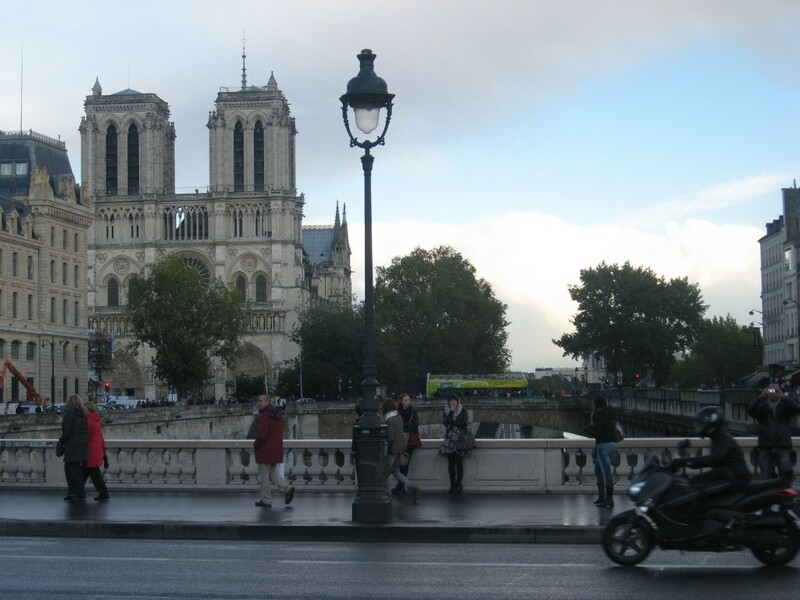 The exploration of Paris has been a varied experience, ranging from grand vistas of the city attributed to the visitation and ascension of the astounding monuments that have attained global iconic status to the most modest nooks and tiny staircases. Little houses snugged between late 19th century apartment buildings. We have discovered streets completely devoid of trees wide enough for a horse cart. Often times we will end up spending the remainder of the day in a newly discovered neighborhood, starting out at the local cafe ordering deux cremes s’il vous plait (two expressos with milk, please), after which we window shop at the various businesses and most likely we come across a community garden and we always stop and sit down at the local city park for our picnic. In Paris neighborhoods there are always surprises, like a squatted vacant lot that has become an urban farm, complete with a cardboard box of free vegetables, or a roman amphitheater tucked into a hillside, which has been transformed into a neighborhood park. 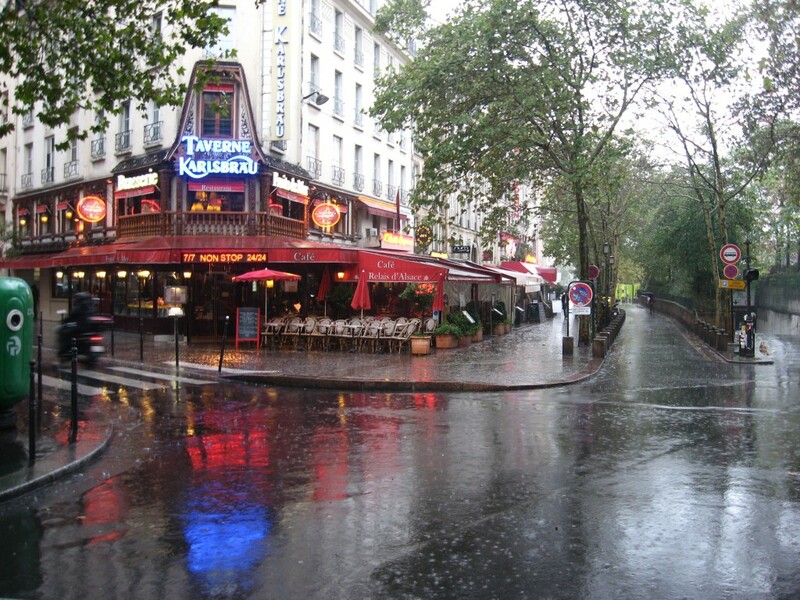 We get a feel for the day-to-day life and the history; every neighborhood has its own atmosphere, on some blocks even a mood; the sense of place in Paris has an impressive imprint on visitors and Parisians alike. 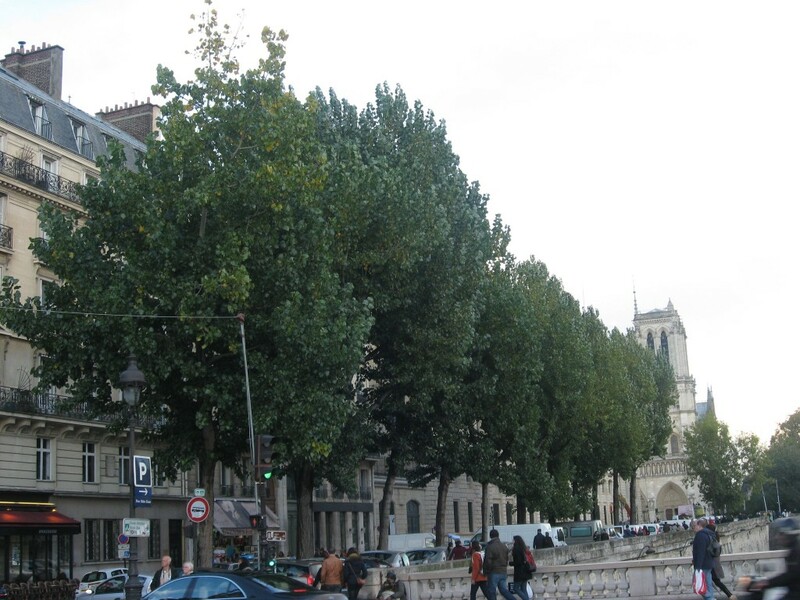 The trees of Paris streets has become a fascinating subject as we have become more interested in trees generally and as we have explored more and more of the city. Street trees especially have been something of a matter of discussion as we observe our own street trees in our fair city, Philadelphia, Pennsylvania. Street trees have become a subject of importance for city dwellers, and we have been navigating this subject for a few years now. What a better tableau than Paris to bring it up! 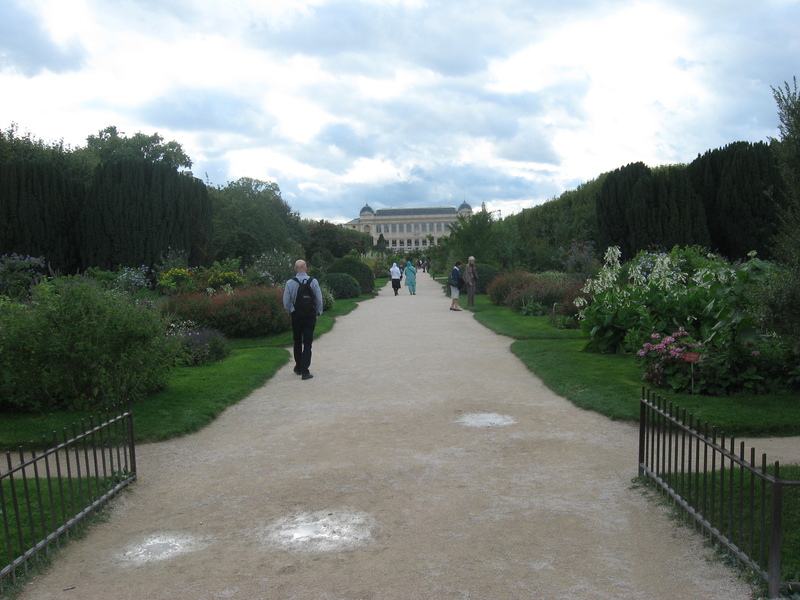 Our explorations of Paris have been pleasant and enjoyable and truly educational on so many levels, especially those considering the ecology of the city. We find that Paris and Philadelphia share much in common with each other at the curbside; like our trash collection and recycling, our street trees are also related genetically. 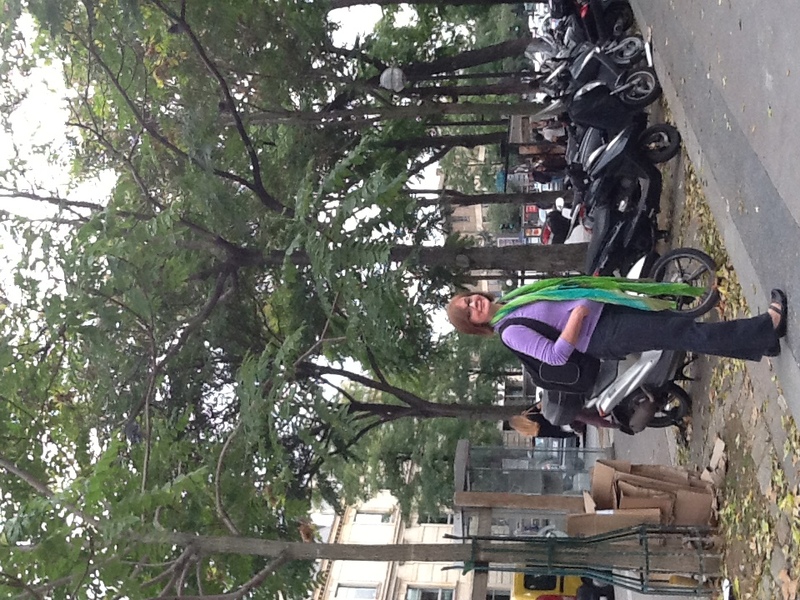 You are invited to stroll the streets of Paris with us, and admire and discuss the trees! 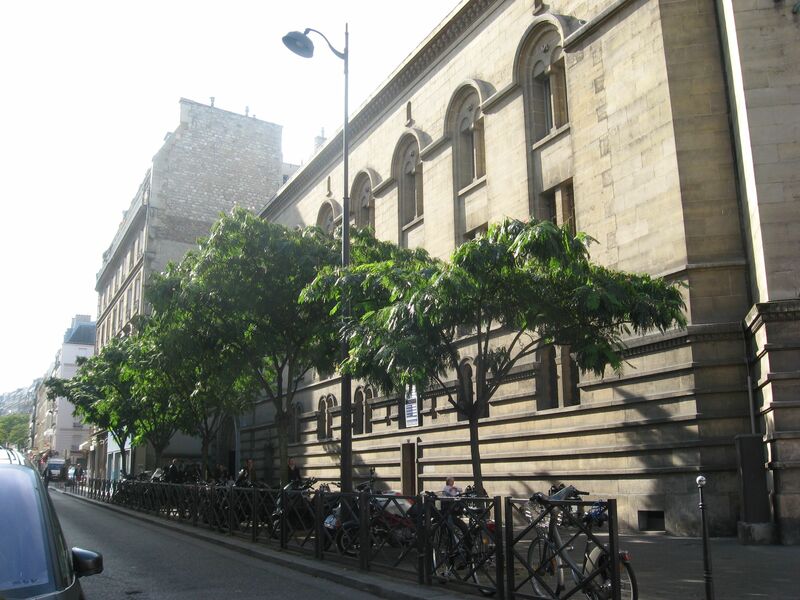 Our exciting adventures through the neighborhoods of Paris have revealed to us the most crispy croissants on the outside and the tenderest on the inside as well as the most favorite street trees of the past quarter century, the American Honey Locust! 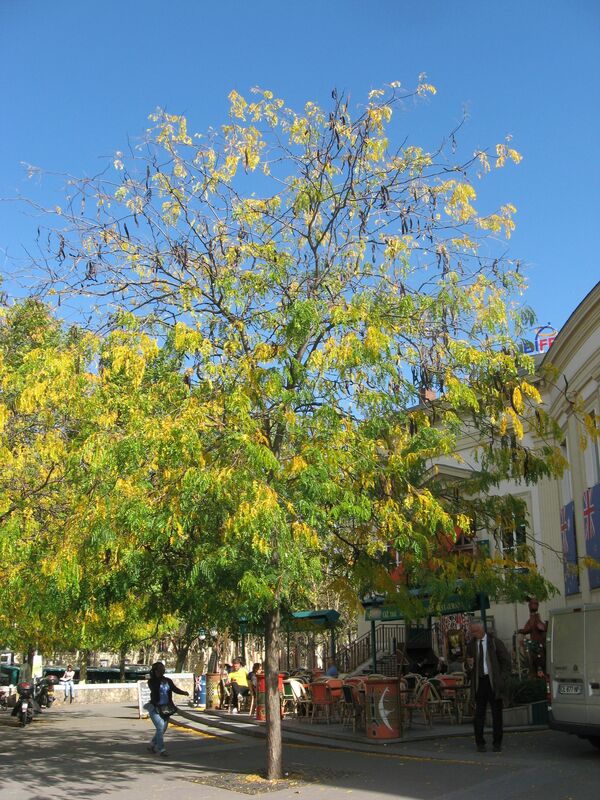 Like the Parisian croissant, the American native Honey Locust delivers a satisfying one two three deliverance of product that truly gets the job done: An attractive tree, fast growing, and easy maintenance: In the fall,the tiny leaflets just blow away from the site. This tree is a favorite street tree. Great fall color too. The Honey locust has adapted to the urban environment beautifully. It is embraced in Philadelphia as well, and can grow out of large pots too. 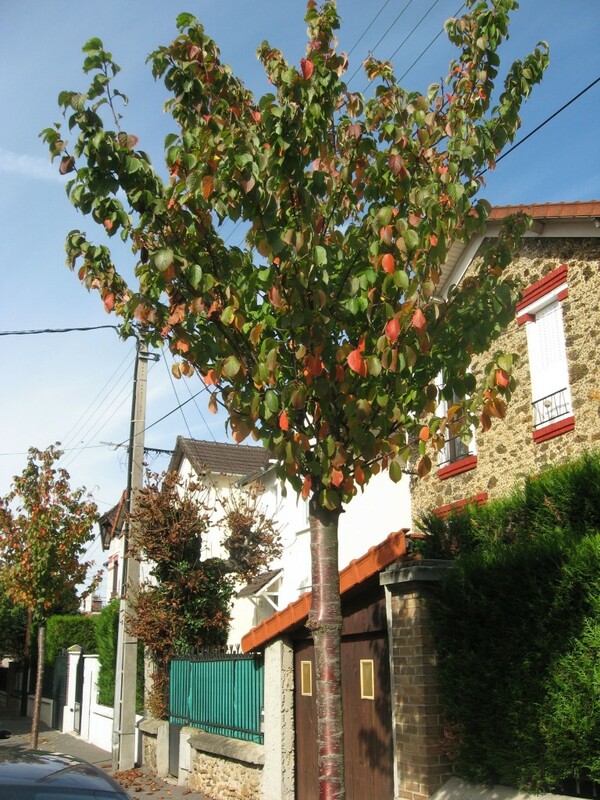 A truly successful street tree requires minimal maintenance, and the ability to withstand harsh conditions. The tiny leaves of the Honey Locust are its biggest advantage in its street tree role, by just blowing away at the end of the season. 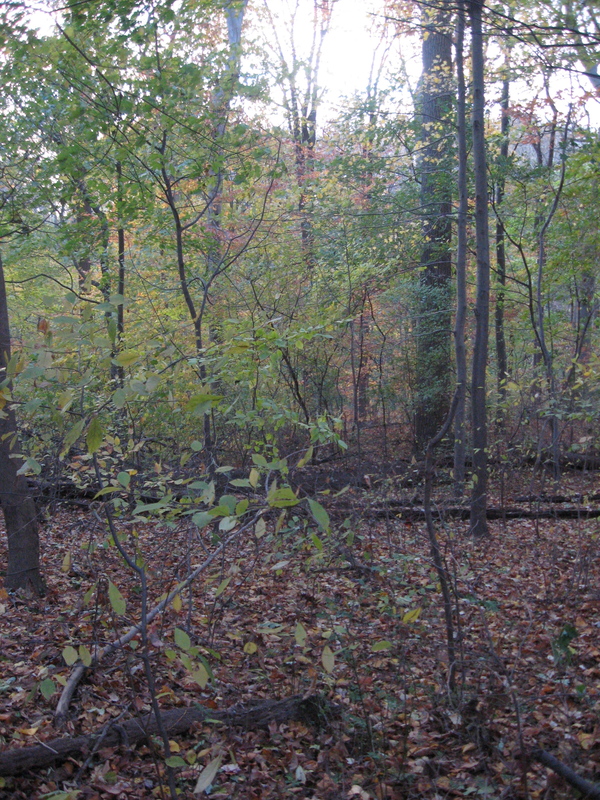 As for problems, the Honey Locust has a few which we should be aware of: The genetic provenance of the street trees planted is weak, which means that most of the trees are derived from a few (at best) selections of the best varieties, and while these varieties have the most characteristics favoring street tree optimization, they may fail prematurely in the sudden disease category. Genetically selected species are ones with a specific genetic blueprint, often one suited for a specific characterization, such as a preferred growth habit, flowering habit, etc., but not necessarily with a long term plan or survival strategy. 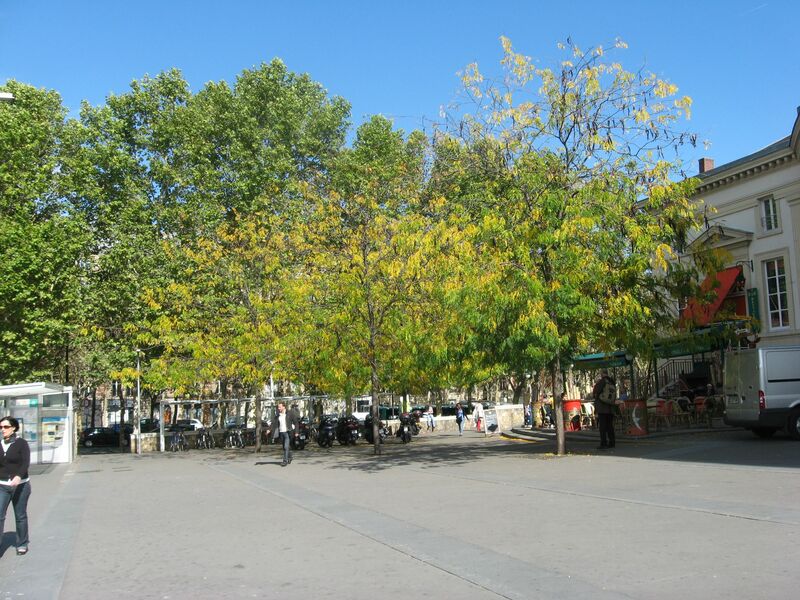 What we are suggesting here is that a street planted up entirely with Honey Locusts that have been selected out genetically for their great adaptiveness, may end up a liability in the long run as these trees may be more susceptible to disease and blight, leaving the street vulnerable to falling and dead trees as well as a complete loss of them. 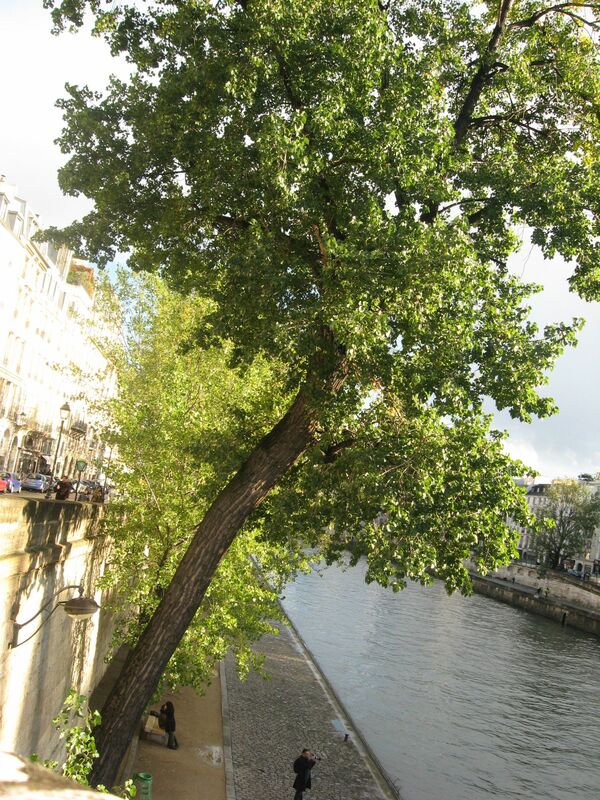 Walking from The Louvre to Place St. Michel, there is a pleasing row of Linden trees along the Seine. These trees have an attractive light green seed in the summer months, which contrasts nicely with the dark green spade shaped leaves. 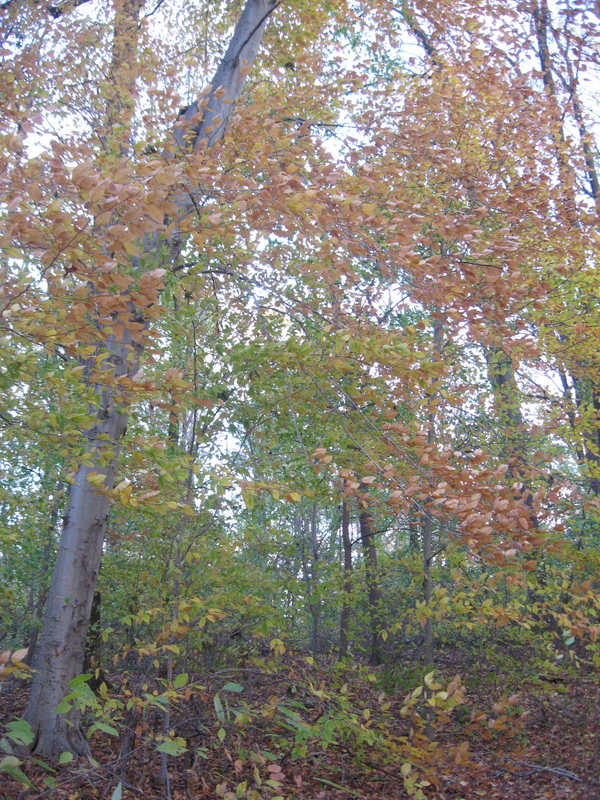 As for growth habit, the first Linden tree picture says it all! 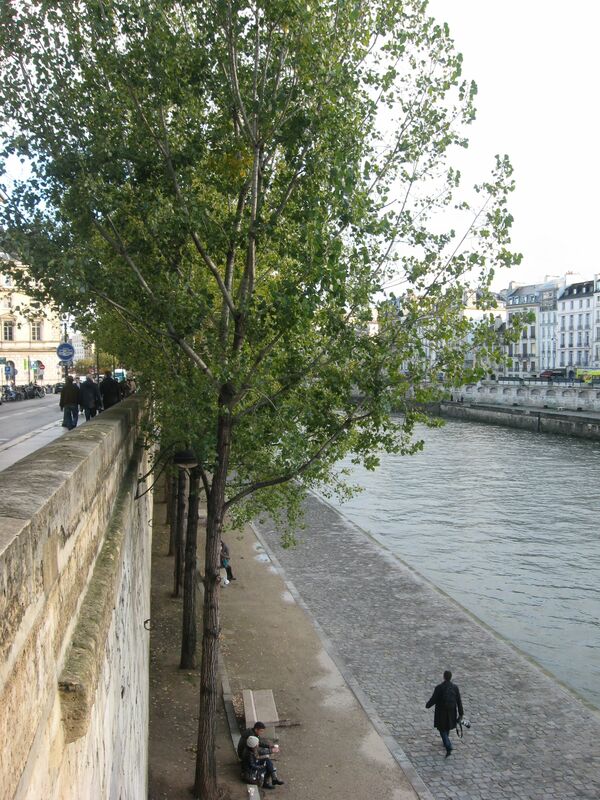 There is a lot of room along the Seine, and the city allows these trees to express their natural growth habit, something often not seen in many streets, especially in the suburbs. 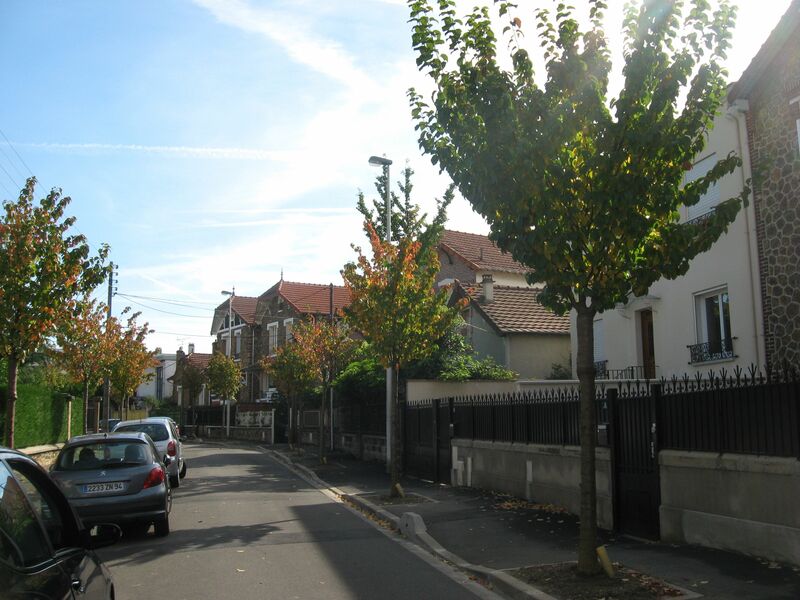 Street trees of the same kind, planted in long rows have an aesthetic appeal that is especially fitting to cities. In Paris, mature, matching trees in a row speak volumes about the sense of place they provide; there is a grandiosity that is particularly fitting to the capital of France and the seat of French culture. They are an extension of the French Garden-into the streets these enormous sylvan caryatids are unleashed unto the city in every direction, gracing in symmetrical equilibrium the magnificence of the boulevards and the buildings. 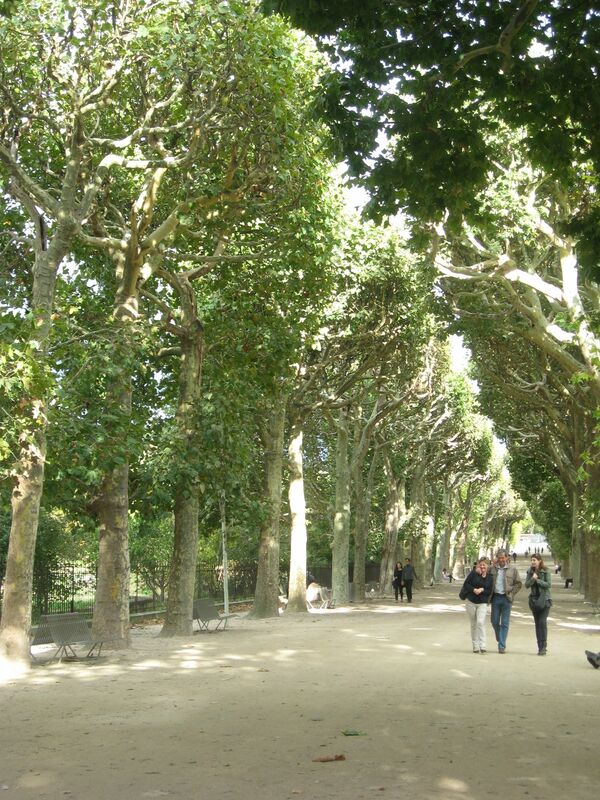 These street trees lead us into the Garden of the Tuileries, the Luxembourg Gardens, The Invalides, in a perfect continuum from the built environment into the carefully planted, cultivated and purposely unbuilt one. 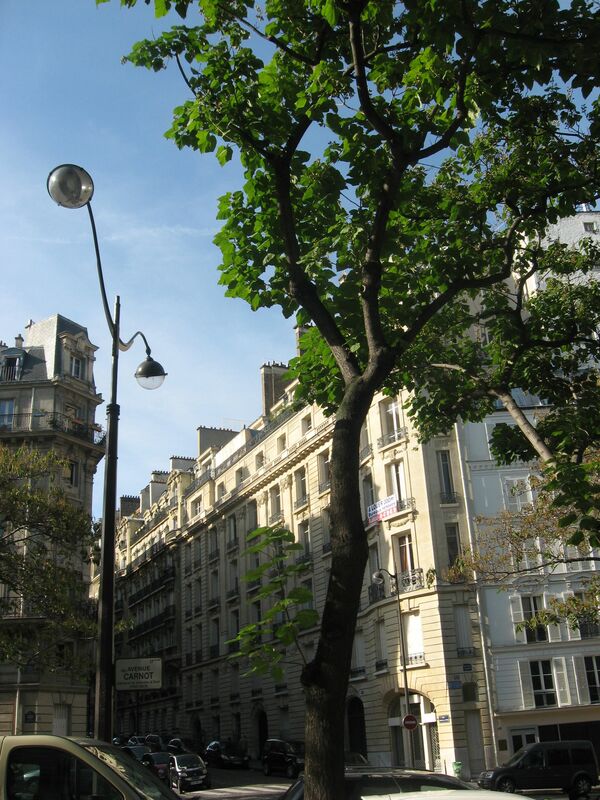 In this manner, the street trees of Paris carry a cultural significance as they extend the ideal of what we now call the French garden into the city streets, to be enjoyed by all. Here is an example of the French Garden, with the symmetrical arrangements of trees and garden beds as well as a central formal axis leading to an important structure, one that defines the property, such as a chateau or palace. This French garden is unique in that its repetitive garden beds are a museum of plants, exhibiting a diversity of plants that extend across the globe, some of them even considered weeds! In this setting, the French Garden is more than appropriate, as it has become a backdrop to the study and classification of plants. The formal layout serves the observer by being a routine context that allows the visitor to focus on the plants themselves and less on the garden setting. So close and yet so far, we find ourselves in another neighborhood altogether. 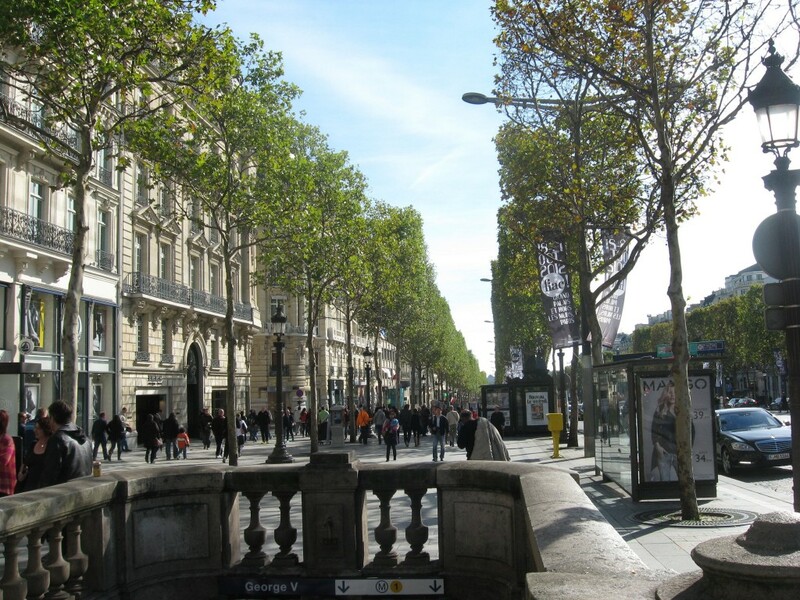 On many streets of Paris, there are few to no trees. There is little room for them. 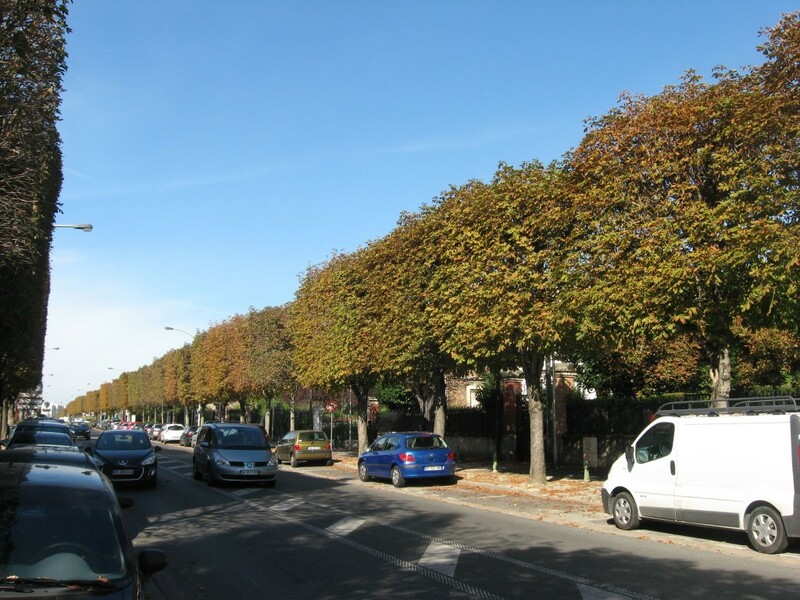 In this picture we can clearly see how the trees are pruned top-to-bottom in a square fashion in the Paris suburb of Le Raincy. These Trees are Horse Chestnuts, and they line both sides of the street and go as far as the eye can see. 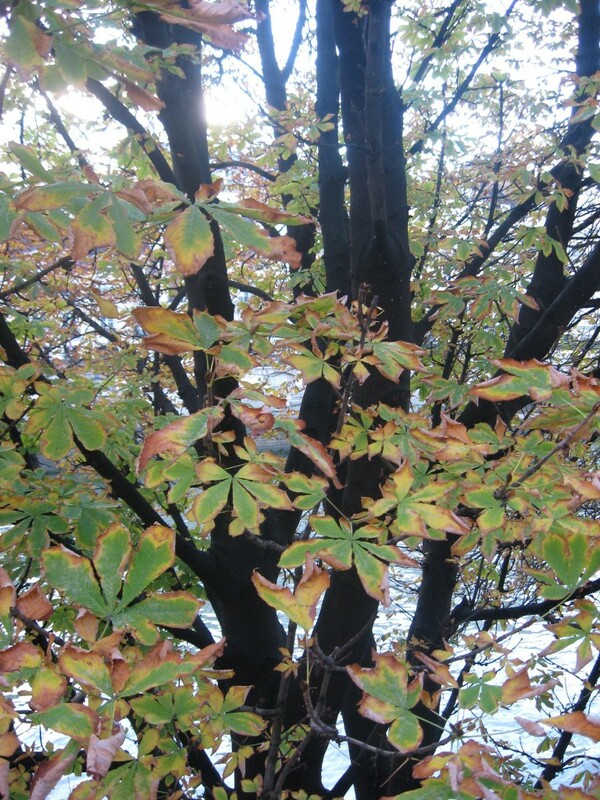 Along the Seine, the Horse Chestnut is allowed the luxury of uninhibited growth, and this tree fulfills the promise of unabated beauty along the water! The dark branches in contrast to the leaves is stunning. 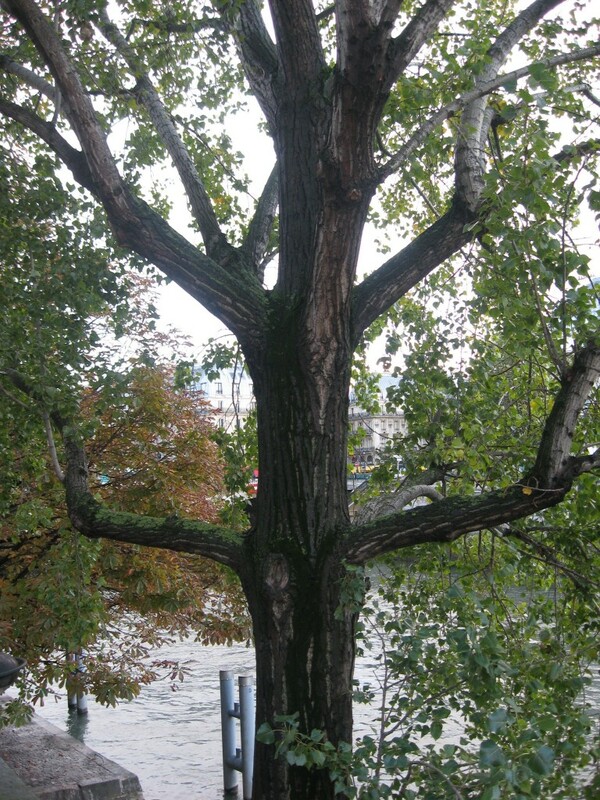 This European tree, with a very small range of indigenous habitat in eastern Europe, had become vastly popular as a street tree. 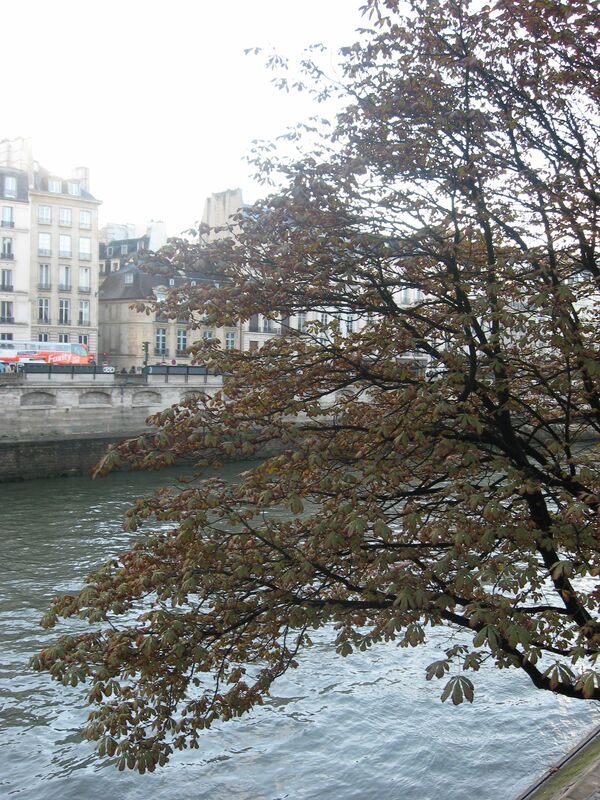 Along the water, in the fall, the Horse Chestnut provides a distinctive texture, in this case a contrasting of colors and silhouette against the watery backdrop of the Seine. 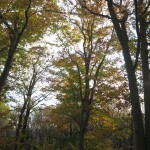 Found throughout the city, the Horse Chestnut as a species, is the dominant tree across many a park and blocks of streets. 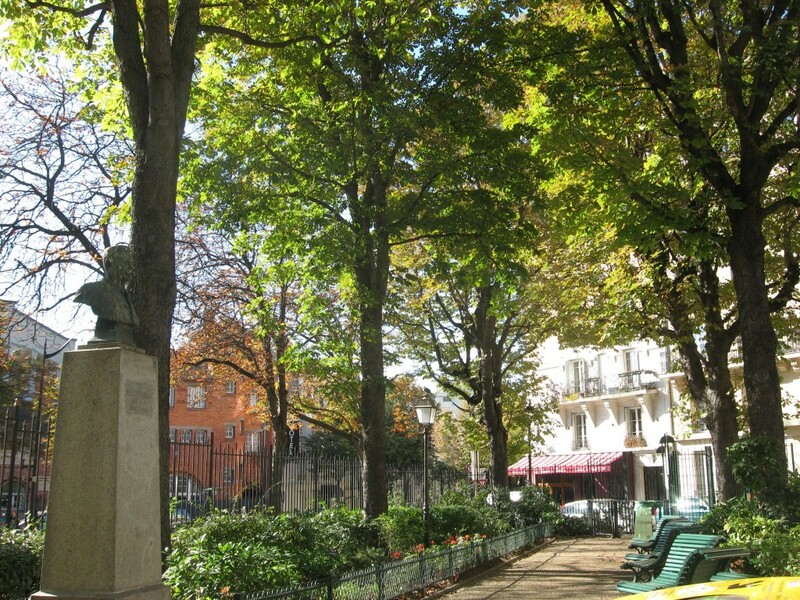 In this park in the Butte Aux Cailles neighborhood we enjoyed pain au chocolat, which is a croissant filled with chocolate from the local patisserie, just the thing after arriving in Paris from a transatlantic overnight flight! 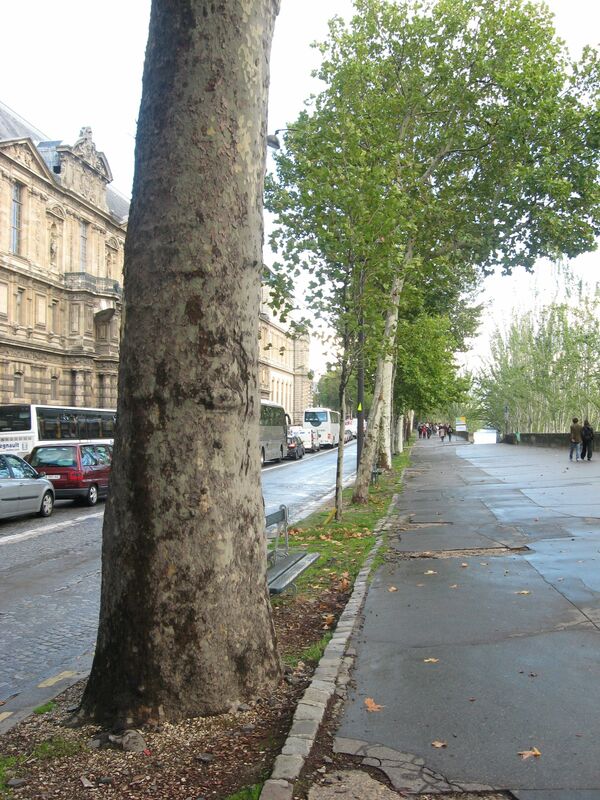 In that sleepless and disoriented state, the idea of the street trees of Paris, as a subject, came into focus. Paris is included among the most grand of cities that is full of spaces in beautiful locations that are just there and have become an afterthought of urban planning, these spots being the ones left behind in the overall visions of the many city-makers through the centuries. Sometimes these places become interesting as charming nooks and crannies that make for a pleasing urban experience, and most often they are just paved over or allowed to become overgrown with weeds. The specific nook pictured above, came into the world with the intention of creating a pleasant space to view the river, but somehow has fallen short of its goal, and remains neglected. 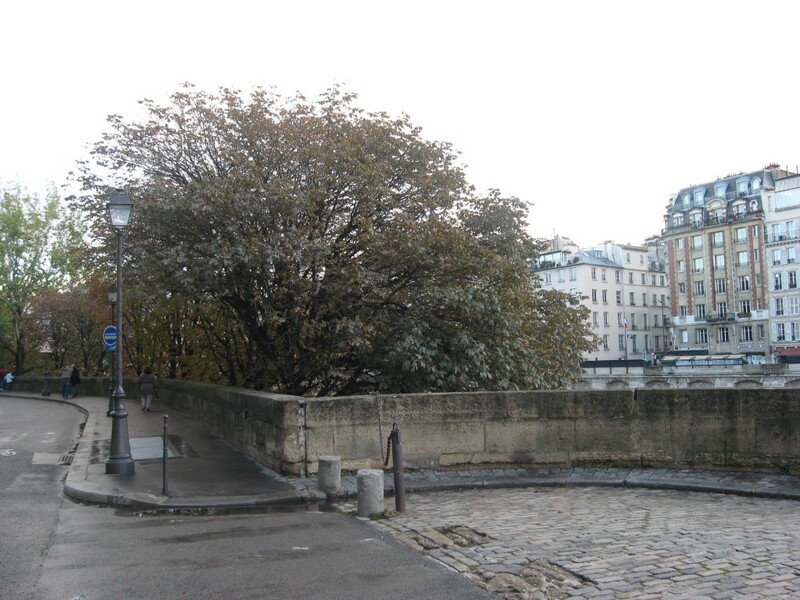 However, it has allowed great views of the Horse Chestnut trees that serve to soften the hardened urban landscape, giving the Seine a more naturalistic look, something the river itself sorely lacks in Paris due to the much needed flood control walls erected to protect the city. 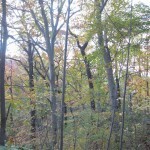 Perhaps shrubs could be utilized as a complement to the trees. Paris, full of surprises, offered us this unique view of the Mimosa, being utilized as a street tree, planted in a neat row. 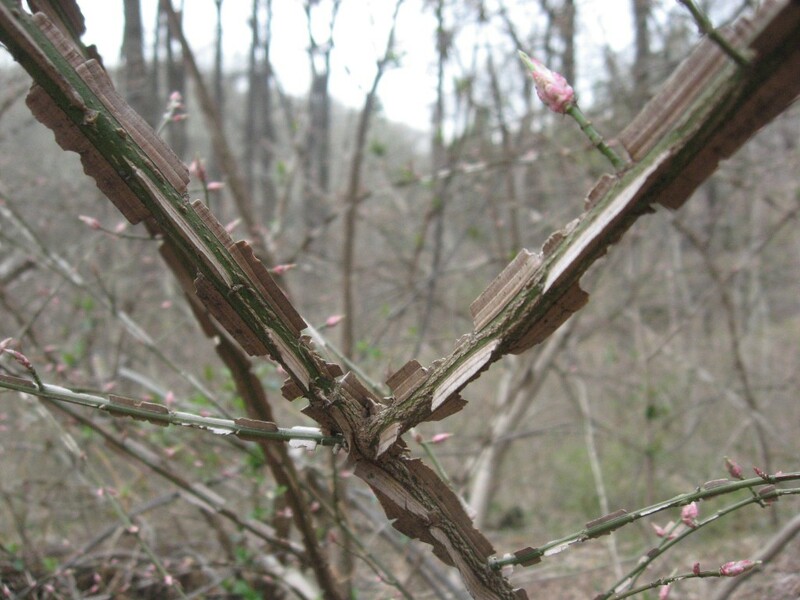 Usually this tree is found growing alongside railroad tracks or in a vacant lot as an invasive weed tree. It seeds itself aggressively, and we are always removing seedlings from our yard and Morris Park. Pruned nicely, these Mimosa do create an elegant row of specimens. Up the street, we are confronted with the Paulonia tomentosa, the Empress tree. Also one we are not used to seeing as a street tree, (except for Logan Square in Philadelphia). These are grand specimens, growing in the near vicinity to the grandiose, awesome and iconic Arc de Triomphe. Also a weed tree, the Empress is a nuisance when left untended and unnoticed until it is a problem. This fast growing asian native has beautiful purple flowers, but throws out seeds that like to grow out of the sides of buildings. From the picture above, even the city of Paris has had some difficulties trying to get these specimens to grow in an elegant and controlled manner. These Japanese Cherry Trees were planted three years ago in the Paris suburb of Le Raincy. All in a row. It is very interesting to see what is being planted, and in what sorts of arrangements-a single species in rows, small trees, large trees, or a variety of trees. What is being planted tells as much of a story as that which has been planted over the years. Japanese Cherrys are widely planted in Philadelphia, and they have beautiful, much admired blooms in the spring. 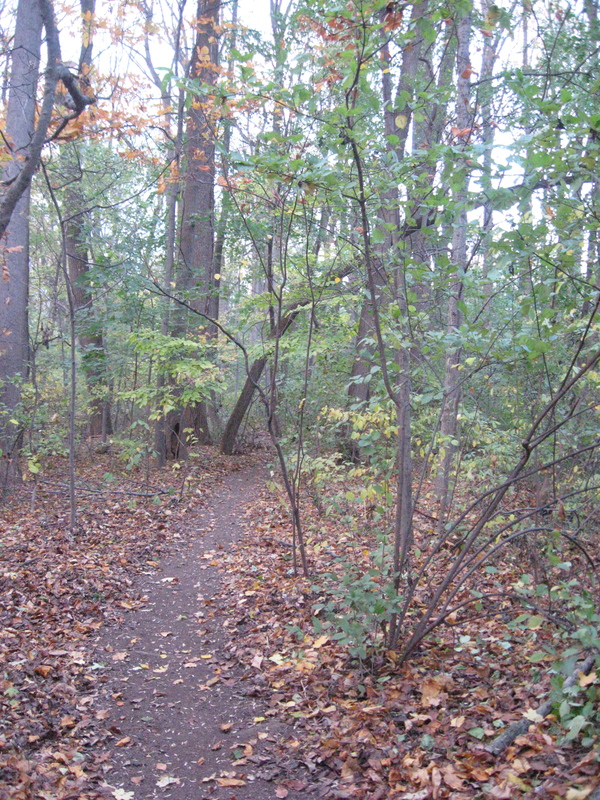 They have escaped into Morris Park and other natural areas in and around the city. 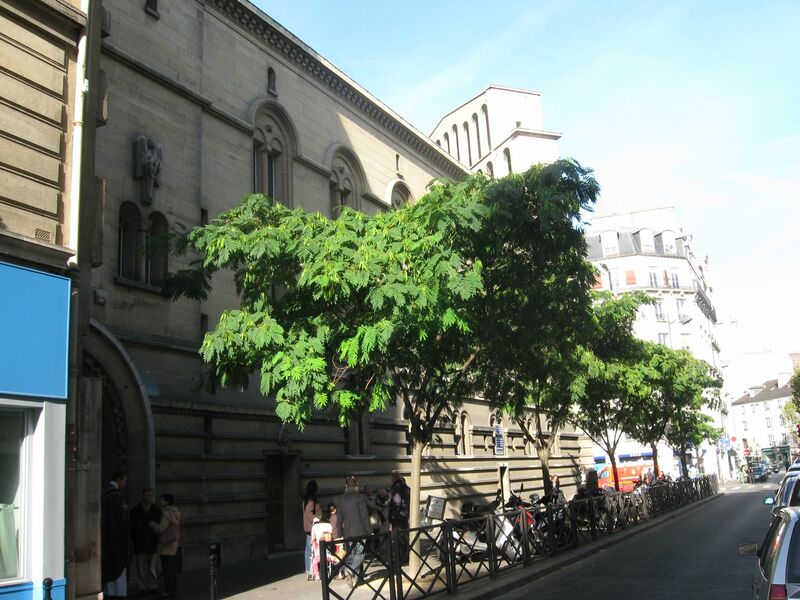 We found the Tree of Heaven, the Ailanthus altissima, growing in a neat row adjacent to the Jardin des Plantes. This was another interesting discovery, given the history of this tree and its evolution as a specimen tree and street tree in Europe and the U.S. 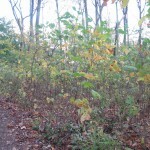 The American Tulip Poplar, Liriodendron tulipifera, has been discovered by the French. 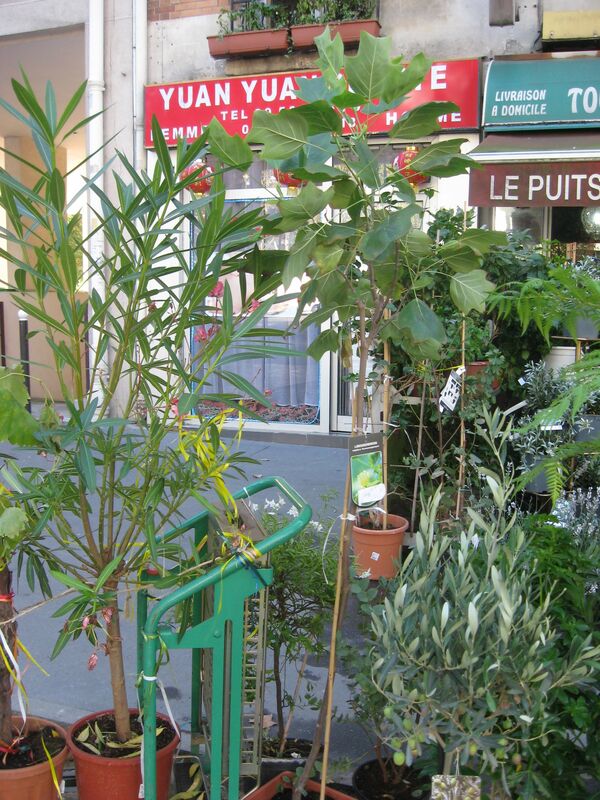 Here, this tree is being sold on the street in Paris. We have found it being planted along streets in Paris as well. This fast growing tree grows a very straight trunk, has attractive leaves and magnificent tulip sized orange flowers. 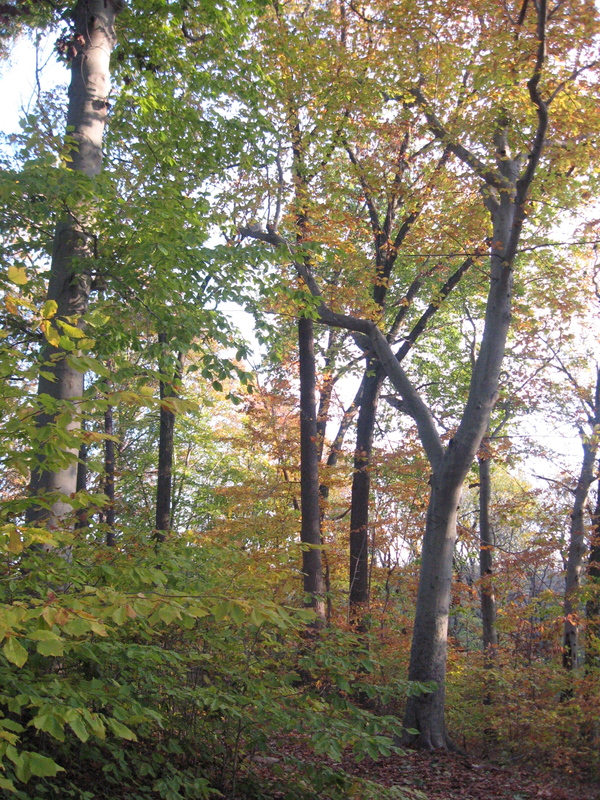 As a street tree, it poses a problem because the wood is weak and the branches are easily broken off, creating a potential danger to property and life. 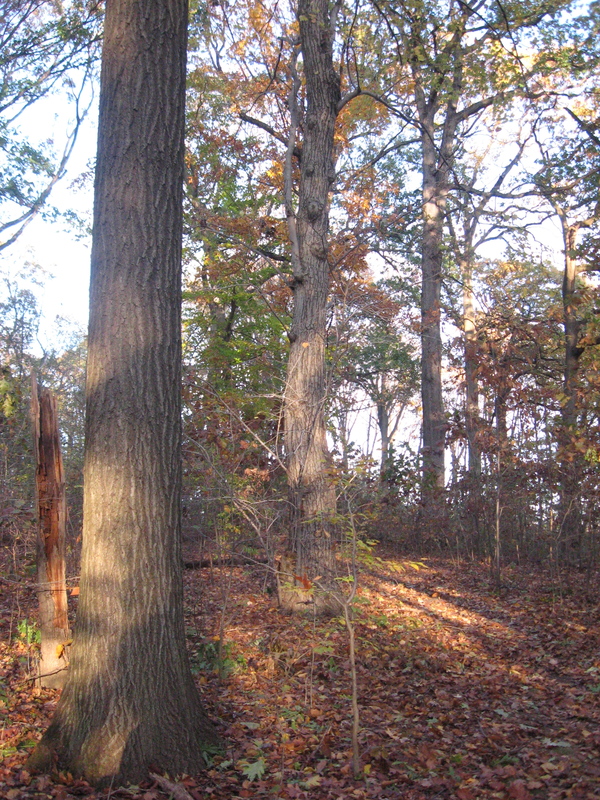 Maybe the City Of Paris can keep up on the maintenance of the Tulip Poplar enough to mitigate this issue. Saving the best for last, dear readers, we have found ourselves on the Champs-Elysees in Paris, one of the most iconic streets in the world, one of the most visited and celebrated, it is a street that lives up to its mythology, it is awe-inspiring and truly memorable; its grandiosity and stature have reached a global definition of the formal road, where there is a location and a direction that can easily identify a nation and a history. 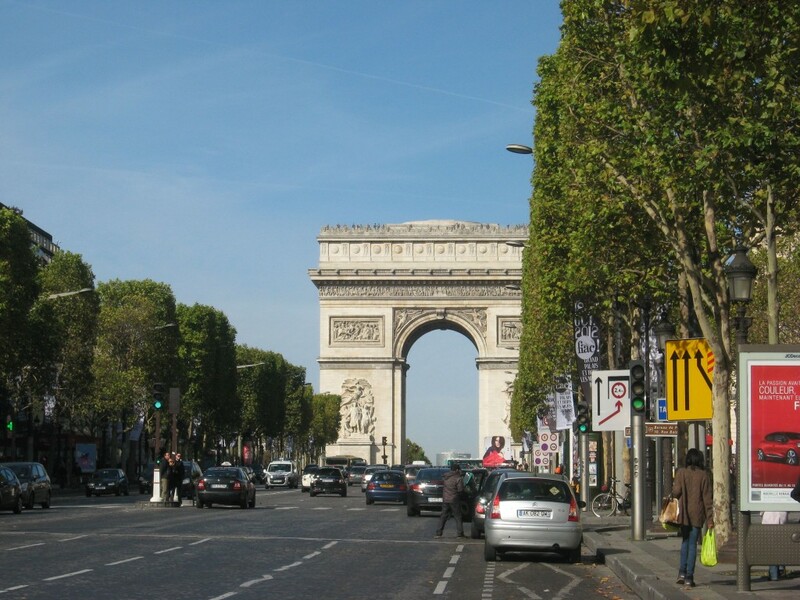 The Champs-Elysees is a proud boulevard and it defines a formal elegance, unmatched and much noticed and appreciated. 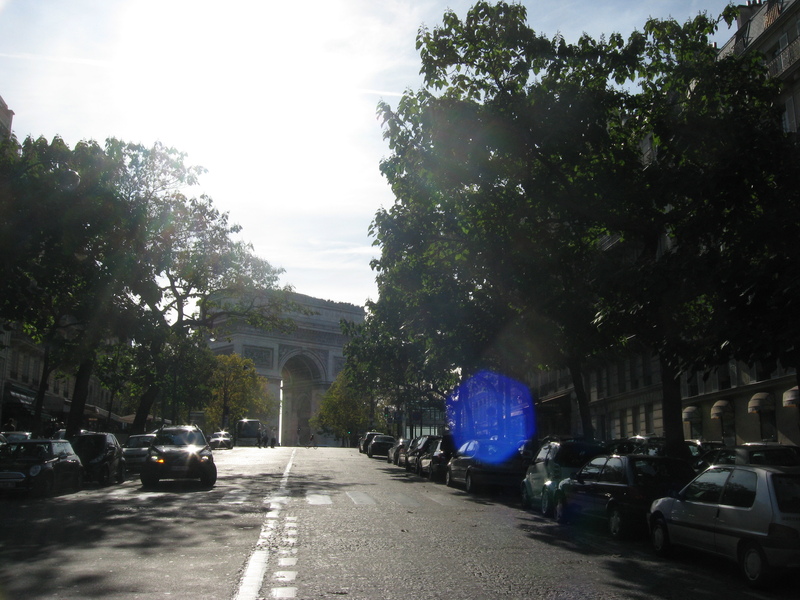 The Champs-Elysees, this aesthetically pronounced allee of magnificence and stately grandeur is lined with the London Plane, a storied tree worthy of its place in the history of street trees. 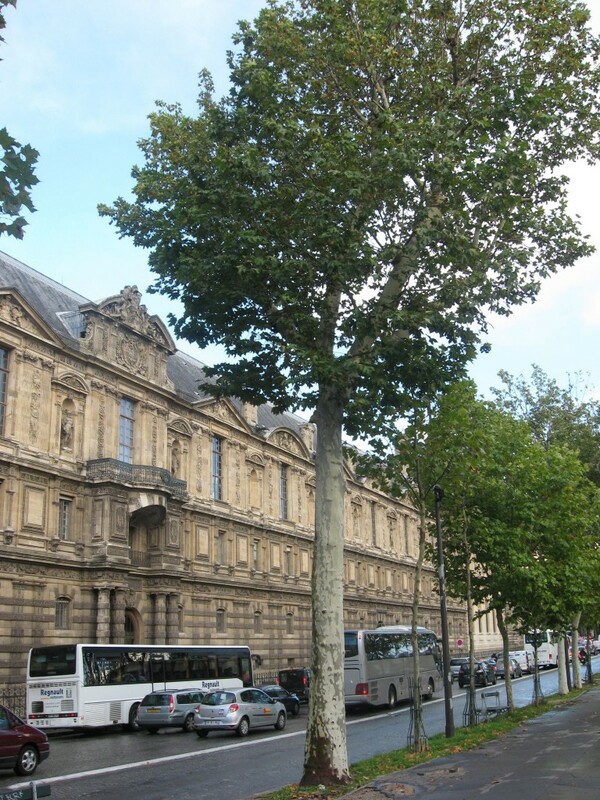 Alongside the Louvre, the Plane tree has been planted, and we are among the privileged to see them in their mature and healthy state. On this block, London planes are still being planted to replace the ones that have died. The London Plane, a cross between the American and Asian Sycamore has been a favorite street tree because of its ability to withstand harsh conditions. 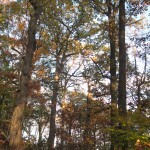 In its natural environment, these trees are found along waterways. In the South of France, they have become diseased, caused by the fungus Ceratocystis platani and many of them are being destroyed. 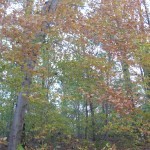 The disease has been found to have originated from ammunition casings made of the American Sycamore wood, brought over by American soldiers in WWII. 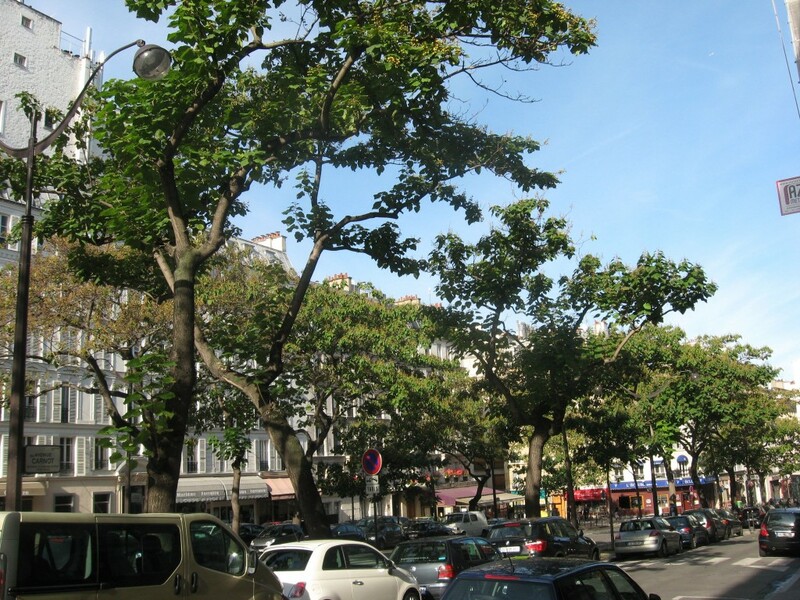 If the disease reaches Paris, there could be a devastating loss of street trees, from the Champs- Elysees to the Jardin Des Plantes as well as throughout the city. 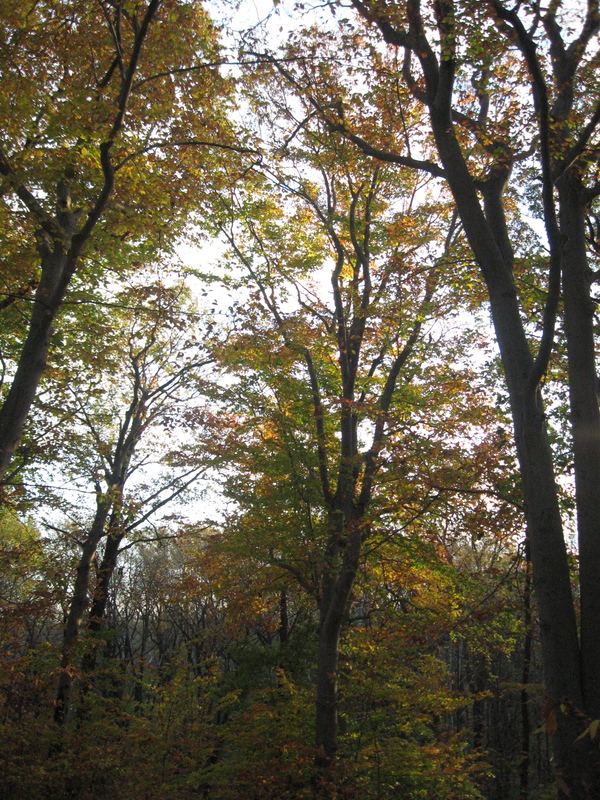 The idea of an allee of identical trees may become a questionable practice as whole streets become treeless in one episode of blight, like the American Elms that were destroyed by the Dutch Elm Disease, rendering whole towns across America treeless. Some streets in Paris are already showing signs that the city is bracing itself for the worst: new trees being planted are of a different species than the dominant, breaking the tradition of continuity and implementing a practice of diversification. With street trees, the lesson is about not putting all of your eggs in one basket as the saying goes. 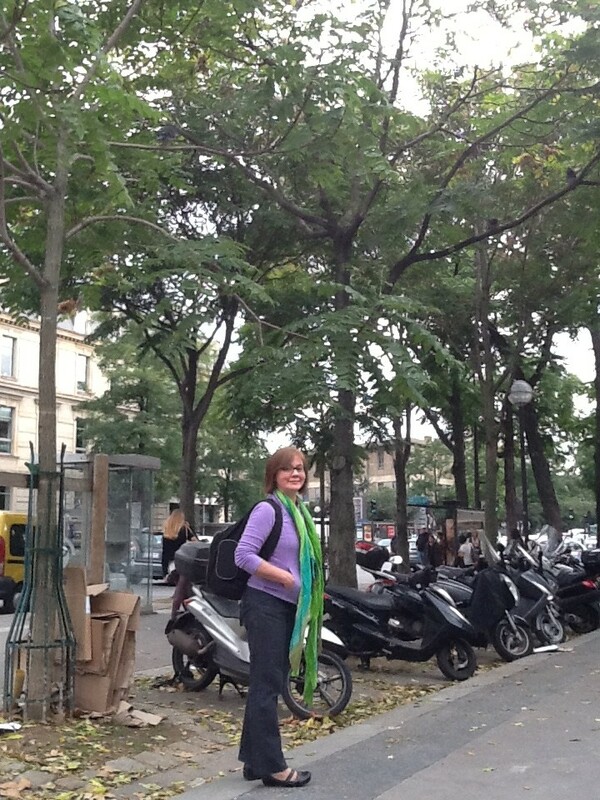 Exploring Paris has been fun and educational on many levels, the street trees being the latest subject of interest. Observing and thinking about them has been eye-opening in that we can get an understanding of the history of the city by the trees that have been planted and where, how old they are, how they are being maintained, and what is being currently planted. The landscape reflects a botanical history of the city; what is of interest and desire, and what foreign trees the city is willing to plant. Trees have also taken part in the aspirations of the city, as well as the nation, maintaining and reflecting the ideals of a society and its relationship with the natural world. It is encouraging to see that ecological concepts are being utilized in some areas, respecting that of genetic diversity and the appropriate responses to plant diseases and their causes. One more thing as we saunter through the city of Paris: The more we learn of the city and the more we discover of its past, the more we learn about where we live, by contrast and comparison alone. When we consider cities as ecologically relevant, as places for human ecosystems to maintain themselves, this ideal is served so much better by the observations of the concerned. It is well worth the trip, especially when we bring our observations home. Please join us again for our next adventure! 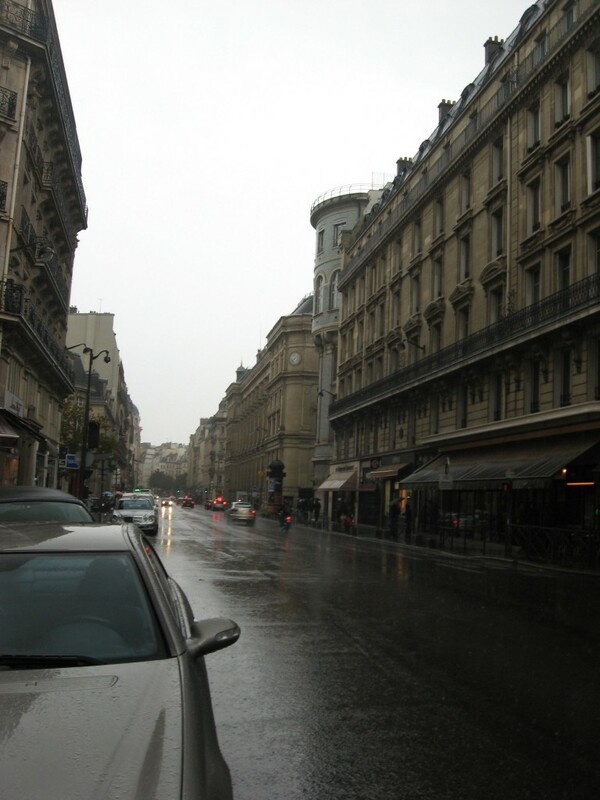 Please read our article Americans in Paris for more! 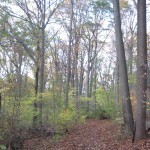 Our walk this afternoon in the park.